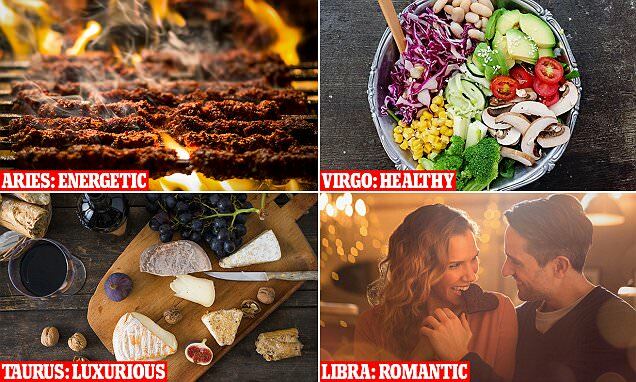 Taureans enjoy luxurious eateries, Geminis like sharing and Virgos are VERY picky: Hollywood astrologer reveals your dining habits based on your star sign... so do you agree? If your ever feeling indecisive about where to dine on a Friday or Saturday night, perhaps the answer could be lying in your zodiac sign. So, in a bid to assist foodies in making the best choice, Hollywood Astrologer and Psychic, Nicolas Aujula, has revealed people's dining habits, favourite cuisines and preferred menu choices based entirely on their star sign. Here, FEMAIL looks at the revelations for each sign - from adventurous Arians to overly private Scorpios. Nicolas, who has paired up with with Australian online restaurant reservation platform, OpenTable, to match customers with their perfect restaurants, says those with an Aries star sign love risk when it comes to their dining choices. 'Being the first sign of the zodiac, they are born risk takers that love to try new foods and cuisines from faraway places that can appeal to their senses,' Nicolas said. 'Aries is ruled by fire and iron and are drawn to spicy food cooked with lots of ginger and chillies. Grilled and barbecued red meat rich in iron and protein are also firm favourites. Perfect restaurant: A 'smokehouse' experience at San Antone by Bludso's BBQ at the Crown, Melbourne. Taureans, Nicolas says, are all about expensive restaurants and luxurious settings. 'Whatever they eat, the food must spark all their senses and they always put quality ahead of cost. Good food is the key to pleasing this zodiac bull,' he said.